February 12, 2011 by Fr. C.
Following our usual weekday Matins at 7:30, Saint Alban’s “little chapter” of those who gather for the office had a Benedictine breakfast with readings to commemorate Saint Benedict Biscop. 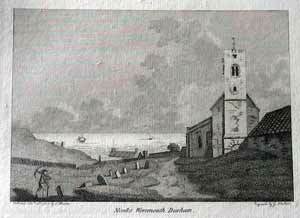 This holy abbot founded monasteries in Weremouth (AD 674) and in Jarrow (AD 681). These monasteries of St. Peter and Paul, respectively, followed the Rule of St. Benedict and were extraordinary centers of learning, the Venerable Bede being foremost among the scholars frome Weremouth. The hearty souls up at such an early hour kept silence during a plain meal of hot homemade oat porridge, bread, fruit and tea, while listening to readings from the life of Saint Benedict Biscop, the Monastic Breviary and the portion of the Rule of Saint Benedict (the great) appointed for the day. We hope that this event will repeat-with advance notice-following Matins on days on or near the Benedictine commemorations throughout the year.